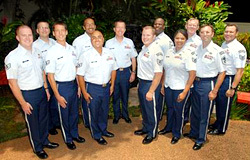 The United States Air Force Band “Hana Hou” is known throughout the Hawaiian Islands for their ability to entertain audiences with high-impact performances in a variety of musical styles. This ten-member group performs the latest in top-40, classic, rock and R&B, as well as being known for tasteful renditions of many “Island Favorites”. These talented musicians demonstrate the professionalism evident in today’s United States Air Force in performances including “Say No to Drugs” shows in island schools, community relations concerts, as well as supporting troop morale and official military functions. In each of these venues, Hana Hou strives to preserve our American musical heritage while projecting the Air Force image.